The enclosed holiday home has been furnished according to modern standards. 80 m² in size, it is suitable for 2 to 5 people. A large balcony, the ground floor entrance and the spacious rooms will guarantee a rejuvenating holiday. Since February 2007, wellness and family-amusement-bath 'Aquasalza', just a few minutes from the holiday home. Special Details: The apartment is close to Salzkammergut and Hohe Tauern National Park as well as all ski resorts in Salzburger landscape. The festival town of Salzburg is reachable in just 20 min by car. Since February 2007, Grolling has a new wellness and water park, that is just 3 walking minutes of our holiday home. You can find more information our webpage. We've had a great time at this apartment. The location is excellent - close to the highway but in a very quiet country-side street. A big supermarket is very close as well. You don't have to climb any stares with your suitcases (the apartment is on the same level as the private parking place). The apartment has everything you might need (and a great view), and above else - an extremely nice owner that genuinely cares about the satisfaction and well being of the renters. For example, as soon as she saw that we have a small boy she went and brought a big box with toys for him. The apartment already has a large selection of toys and games which our 3 kids enjoyed playing with every day. In short - highly recommended. Perfect location, clean, cozy and kid friendly. Beautiful, clean and perfectly located home near Salzburg. Quaint and quiet town with so much history and nature to explore. Waterfalls, valleys, churches and castles all near this beautiful home. Comfortable beds, views, everything you would need and more. My three daughters had endless fun with the games and toys provided by Margrit. We had a wonderful experience and would love to come back someday! 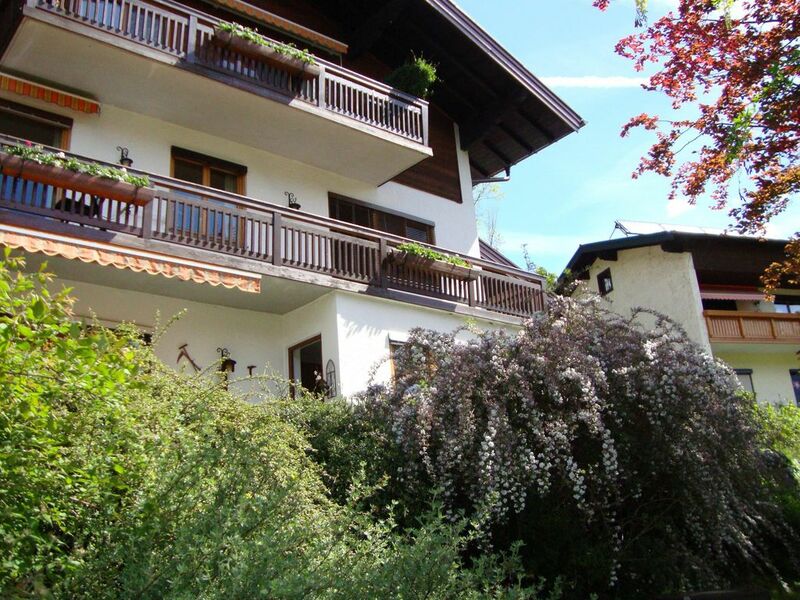 Lovely property, well-equipped, brilliantly located and helpful owner. Very comfortable. Great stay! The property is lovely, very comfortable, practical and has everything you need and more. There are beautiful views across to the mountains which we enjoyed from the many windows and glazed doors which face the view, and balcony which was lovely and sunny. Margrit, the owner was so helpful the whole time we were there and was very knowledgable on the local area. The location of the property is excellent. Besides the beautiful views, you are only a 10 minute walk from the town centre which has restaurants, bakery, cafes, butchers, post office, shops etc and 15-20 minutes from the train station. We holidayed in this property with our 3 children, 12, 10 and 8 and the local walking was brilliant for them. There are a lot of lovely things to do in Golling itself, the waterfalls, lakes, nature park, local mountain the Rabenstein where you can see Salzburg castle from the top, a castle, a lovely swimming pool with heated outdoor pool, lazy river, flume, jacuzzi etc and spa which is on the same road as thr house 3 minutes walk. It is easy to get into Salzburg or Werfen or Hallein on the train. There is also a good local bus service. No need for a car. There is a supermarket a 10 minute walk away. All in all we had a great time and would highly recommend this to anyone wanting to stay in the area. I have already recommended it to my mum who is planning on re-visiting the area at some point after having stayed in central Salzburg last year. Here in Golling you get the best of both. Quiet beautiful surroundings with easy, quick and inexpensive links to so many places. This was the best place we stayed in on our trip! Beautiful location (only a short drive to Salzburg) with fantastic views from the balcony, where we sat and had dinner most nights. Margrit was a wonderful host, providing us with everything we needed and also valuable information that you can only get from locals. Her daughter Christina handles the booking details and was the easiest person to deal with in regards to this. The house was equipped with everything that you would ever want, with the kitchen and bathroom being a real highlight (this is where many of the other properties we stayed at on our trip really lacked). Actually, every room in the house was great! The rooms are also quite large, you feel like you have plenty of room to spread yourselves out and really relax. We stayed here with our 2 children (aged 8 & 10) and they loved having a separate bedroom to us, each child with their own bed. A true home away from home - 5 star property at a very reasonable price! We also had a car, so the on-site/off street parking was also much appreciated. The supermarket was also within easy walking distance. We could not find fault with this property. Our only regret was that we wished we had have stayed longer! Thank you Margrit and Christina! Die Wohnung war sehr sauber, gut eingerichtet (es gibt sogar Spielsachen für die Kinder) und gut gelegen (sonnig, naturnah und trotzdem gut angeschlossen an ÖV und weitere Infrastruktur), nette und unkomplizierte Vermieterin... Wir waren also rundum zufrieden und können uns gut vorstellen, wiederzukommen. eine sehr schöne und geräumige Wohnung. Sehr gute Küchenausstattung. There are beautiful hiking and cycling paths in the region, making it a good vacation destination. The festival town of Salzburg is just 25 km away. All well-known ski resorts are reachable within 30 min. Golf: All golf courses in Salzburger's landscape are easy to reach! Ski: All large ski regions of Salzburg can be reached within a short drive by car or by bus. Preis pro Nacht für 2Personen ( 1 Schlafzimmer ) € 65. - nur Februar bis Mai möglich ( Kind im Babybett gratis) Preis pro Nacht für 3-5 Personen ( 2 Schlafzimmer) € 90.- Sommer 95.- Winter Zum Mietpreis pro Nacht kommt die Kurtaxe von € 1,50/Ew/Tag hinzu. Für die Endreinigung fällt eine zusätzliche Pauschale von € ,-/40.- an. Wir bitten um Barbezahlung vor Ort, keine Anzahlung nötig!